Explains how to use the ILNumerics Optimization Toolbox in order to find minimia of nonlinear functions, subject to constraints. 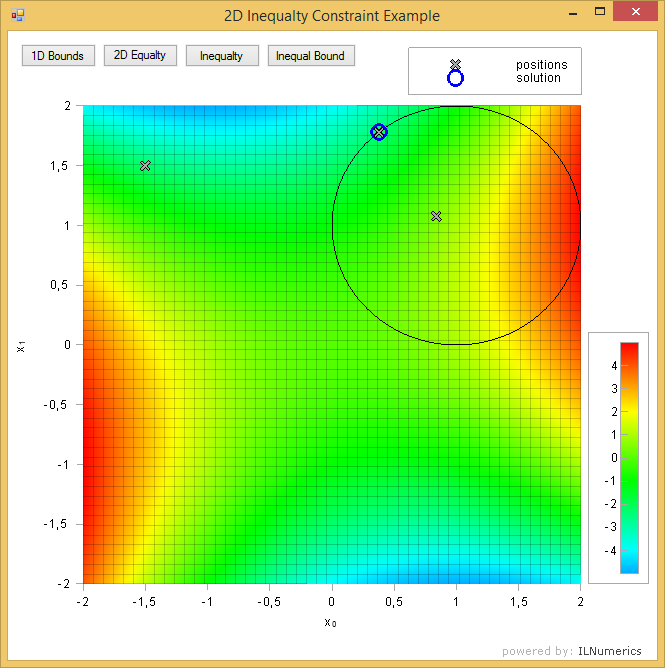 The example application hosts 4 individual examples: 1D Bounds, 2D equalty constraints, inequalty constraints and combined inequalty- and bound constraints. Each example is activated by an individual button on the main example GUI. The ILNumerics Visualization Engine is utilized in order to plot the function and the solution together with the path passed from the start to the minimum. This example serves as accompanying material for the online documentation for constrained optimization solvers.